We offer a tailor-made product package which focuses on important life events and supporting our members during those times. Wear a personalised emblem that will allow first responders to immediately identify your allergies and/or medical conditions, and treat appropriately. Access to our 24-hour Emergency Contact Centre, where medically trained consultants will communicate your vital medical information to emergency responders as required – anytime, anywhere, in any of our 11 official languages. The peace of mind that your next of kin can be notified speedily in the event of an unforeseen emergency. One call to our Emergency Contact Centre can access this information, stored on our secure database. Receive a wallet card with all your emergency contact numbers. Free MedXpert medical scheme advice and support services. Click here for detail. Family assistance benefit is a 24 hour/365 days a year service which provides invaluable support to members during traumatic life events. Click here for detail. Funeral benefit which pays a cash benefit of R10 000 on the death of the members. Click here for detail. Monthly fee of R31 payable via debit order. 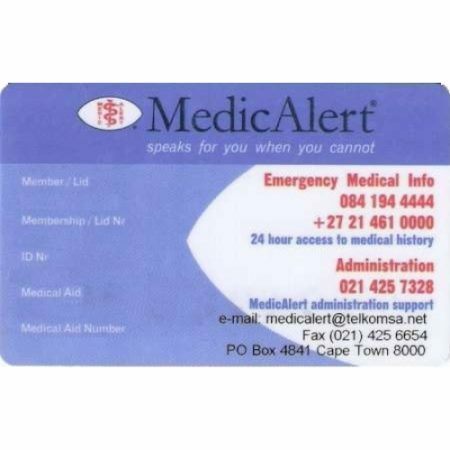 Complete this medic alert registration form to apply for membership and complete your debit order details for the monthly fee of R31. Where did you hear about MedicAlert? I hereby authorise Medic Alert to debit my bank account as set out above. I understand and accept that my specified bank account be debited with the specified amount on the specified day each month. I understand and accept that this authorisation will continue until we receive written notification to discontinue. I undertake to keep Medic Alert informed regarding changes to my account at all times.